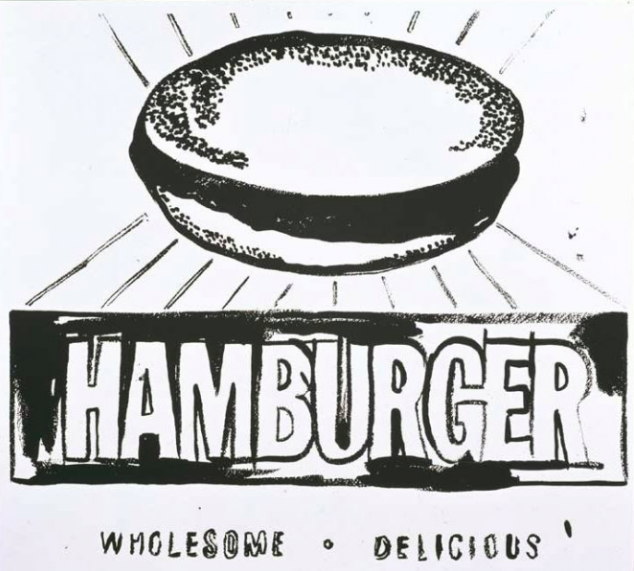 This diptych, featuring the iconic American hamburger, is reminiscent of Warhol’s earlier screen prints of American popular culture. Yet it also resembles both a mushroom cloud (associated with nuclear explosions) and a glowing halo. During the mid 1980s Warhol returned to the newspaper adverts that had informed his paintings of the early 1960s. They are mostly black and white and were created by tracing the original adverts by hand, which creates a looser, graphic quality. During the 1980s the U.S.A. was still in the depths of the Cold War. Within this context three themes emerge in these paintings: war, death and religion. Andy Warhol’s late period was characterized by a burst of artistic innovation and production. Those surrounding Andy Warhol during this time remarked on his tremendous vitality and enthusiasm as Andy Warhol re-immersed himself in painting. Andy Warhol embraced each new idea passionately, working tirelessly on his many projects.